You can start any program from within your Microsoft PowerPoint 2013 presentation. Programs open separately from PowerPoint and are not embedded in your presentation. On a slide, select the text or object that you want to trigger the other program during your presentation. On the Insert tab, in the Links group, click Action. To open the program when you click the text or object during your presentation, click the Mouse Click tab. To open the program when you move your pointer over the text or object during your presentation, click the Mouse Over tab. 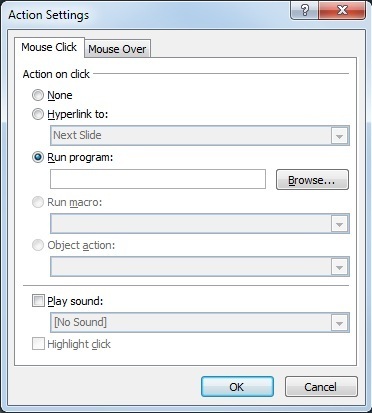 Click Run program, and then type the path to the program (.exe) file that you want to open, or click Browse to search for it. Tip: To make it easier to browse and find the program that you want to use, make it available from your desktop.